November 1st 2009 saw a law change and it became illegal for drivers to use a hand-held mobile phone while driving. to make, receive, or terminate a telephone call, to create, send, or read a text message or email, to create, send, or view a video message or to communicate in a similar way in any other way. The ban also includes other telecommunications devices such as the Blackberry and Personal Digital Assistants (PDAs) but excludes two-way radios. 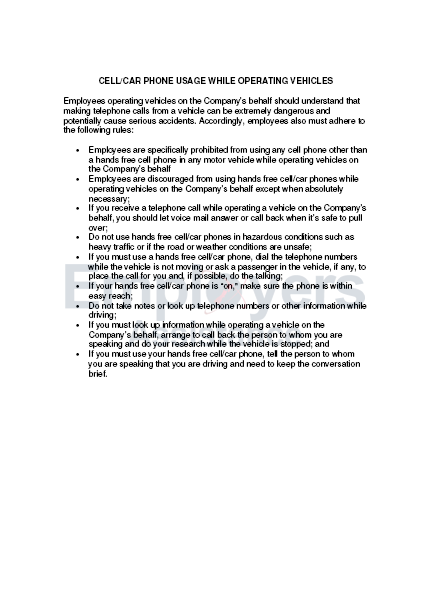 However, a driver may, while driving a vehicle, use a mobile phone in a way described above if the mobile phone does not require the driver to hold or physically manipulate it to make, receive, or terminate the call (e.g. Blue Tooth technology) or is secured in a mounting fixed to the vehicle and the driver manipulates the phone infrequently and briefly (e.g. hands-free kit). It is good business practice to have a policy in place to outline what is acceptable practice for staff when using vehicles on the company's behalf. Here are the essential elements to define such a policy and comply with the law. "..EAL's knowledge on the employment act and related acts is immensely powerful for a company to have at their disposal.."
"..Over the past 16 years that we have been using EAL we have found their advice to be invaluable.."
"..We have been with E A for a number of years and have greatly appreciated the advice on employment matters and the drafts of employment agreements. I would recommend your organisation to any business..."